Has your complexion become dull? Do you want to restore the youthful glow and color to your skin? Chemical Peels are a great way to get rid of unwanted surface dark spots and create bright, glowing complexions – which are often hiding under those first layers of skin. Fountain of Youth specializes in the process of Chemical Peels, along with many other treatments that give your skin a renewed appearance. Our experts will work with you to see which chemical peel is right for your face. Not all chemical peels are made the same and not every client is advised to experience this treatment. Our ideal candidate is not trying to remove laugh lines, rejuvenate sagging skin, or erase deep wrinkles. Most often clients will request a chemical peel to help with acne scarring, sun spots or unwanted ‘bland’ complexions. In addition, we see more success from the treatment with fair-skinned candidates. Though a chemical peel will be effective on darker skin, the process has a greater chance of producing an uneven skin tone. Chemical Peels are often used to treat many different skin issues. The three main skin conditions we often use a chemical peel as a treatment for, and they are acne, age/brown spots, and rosacea. Please keep in mind that all skin types require a custom treatment plan that our experts will tailor for specifically for your skin during the consultation. Also, the skin does change over time and so should your treatment plan. Meaning, the same chemical peel you had a few months ago will likely change according to the condition of your skin prior to your appointment. The Fountain of Youth process for getting a chemical peel is very simple. Please call our office to schedule your appointment at 251-525-8446. It is important that you arrive free and clear of all makeup to your appointment. We also recommend that you do not have any other treatments, such as a facial, chemical peel, botox, laser hair removal, prior to seeing the doctor. If you have had any of these procedures done, our intake process will assess the appropriate time frame to undergo the treatment. The treatment is performed in-house and does not require an overnight stay. The process incorporates an exfoliant, multiple layers of special chemicals made for the face, and a cooling after solution. The chemical solutions that will be applied to the face can be but are not limited to- glycolic, trichloroacetic, salicylic, lactic, and/or carbolic acid. Before getting any procedure done, be prepared to discuss all medications that you are currently taking. Also, we will provide aftercare procedures and a possibly ongoing treatment plan. It is the desire of The Fountain of Youth for you to achieve your health, beauty and wellness goals. Please call us today to schedule your one on one consultation with one of our experts- 251-525-8446. Many women and men who suffer from Rosacea find relief with medication and an occasional chemical peel. Rosacea more often occurs in people over the age of 50 and is a condition that causes redness and raised swelling on the face. Rosacea can be painful and feel as though your face is burning. Chemical Peels can also reduce or lessen the appearance of age spots and brown spots on the face. Age spots are simply explained as an excess production of melanin, or skin pigment. The causes are usually from excessive exposure to the sun, either from tanning, or other prolonged activity from the harmful rays of the sun (UV). A chemical peel to treat acne is used to open dry or tight skin and not recommended so much for those with oily skin. In addition to the chemical peel process, we also recommend Dermaplaning. Dermaplaning, which is also called microplaning or blading, can be added to your facial procedure. This process further removes the outermost dead skin cells and exfoliates the surface layers of your skin using a very small blade. Have You Ever Had A Sunburn? It is normal to feel burning during the treatment process. The chemicals used are intended to burn the layer of skin away to reveal a new and more supple facial appearance. The burning sensation may last longer for some skin types, but most people say it lasts for under ten minutes. Many people say the afterburn is similar to a sunburn. 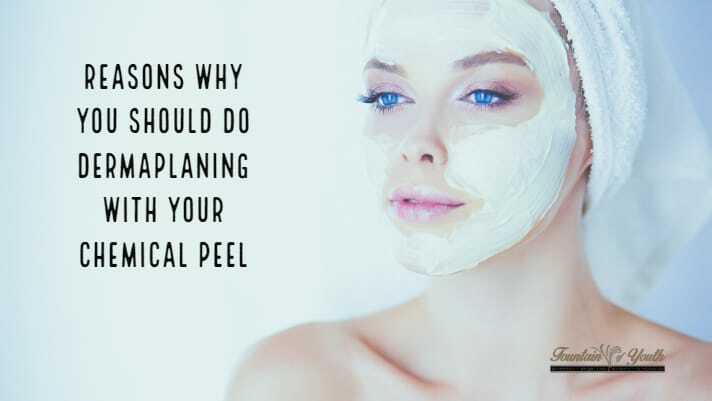 However, this is not the case for those who require a deeper peel as the duration of the chemicals and amount may change per your treatment. Once the burning subsides, the facial skin will also lose the redness associated with the chemical peel. The results will likely be visible within a week and sometimes as soon as 3 days. Some clients will include multiple treatments in their plan. You can repeat a lighter process in as soon as a few weeks after your initial chemical peel. Many clients will continue the process until they achieve the end results they most desire.